We’ve all seen the movie. A bustling inner city experiences the flight of people and businesses to the outer edges or suburban locations and then falls on hard times. The city becomes a suburban story and lacks the creative core that attracts younger people and new residents. The economy falters. This could be the Brooklyn story, the Newark story, the Detroit story, the Buffalo story, the Cleveland story and many other stories. 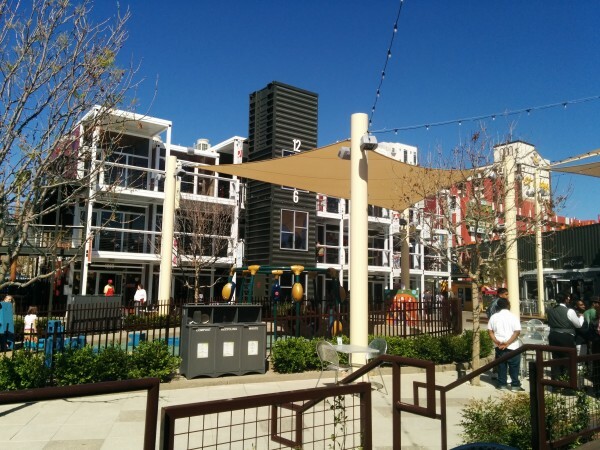 So it was really great to see what Tony Hsieh and his colleagues are doing at the Downtown Project in Las Vegas. The Gotham Gal has made a number of investments with Tony and his team and so she asked if we could get a tour of their efforts while we are in Vegas this weekend for our friends’ wedding. We spent most of Friday touring the work they are doing. And it is impressive. The downtown Vegas story is a similar one. The hotels and casinos left downtown for the strip in the fifties and sixties and the city center faded leading to crime and decay. It was a tough place to live and/or work. When Tony moved Zappos from the suburbs to the former City Hall in downtown Vegas a few years ago, he decided to invest $350mm in a massive urban revitalization project. He set aside $200mm to purchase land at bargain prices and the other $150mm to invest in three areas, arts and culture, small businesses (restaurants, cafes, bars, markets, boutiques, etc), and tech startups. $50mm is going into each area. I was particularly impressed with The Container Park which opened late last year and houses food shops, boutiques, a playground, live music performances, and is a great place to hang out with friends and family. Here’s a photo I took while we were enjoying tacos at lunch on a sunny day in downtown las vegas. They have also taken a number of residential and hotel buildings and converted them into low cost and attractive housing for the hundreds of college grads who are moving to Las Vegas to work in the tech startups that are cropping up everywhere, largely funded by Tony’s Vegas Tech Fund. You can feel the excitement and energy in the coworking spaces that are cropping up all over the place. There is a sense of purpose that goes beyond building a startup. They are also building a community and revitalizing a city. It’s too early to know if this audacious project will work. But I think it has a decent shot. And mostly because Tony and his team focused on art, culture, lifestyle, housing, night life, parks, and recreation first and foremost. That’s the only model that I think can work and it seems like its working in Las Vegas right now.